In a packed-to-capacity function room at the British Hotel at the end of May, SCBWI SA members met for our mid-year dinner. 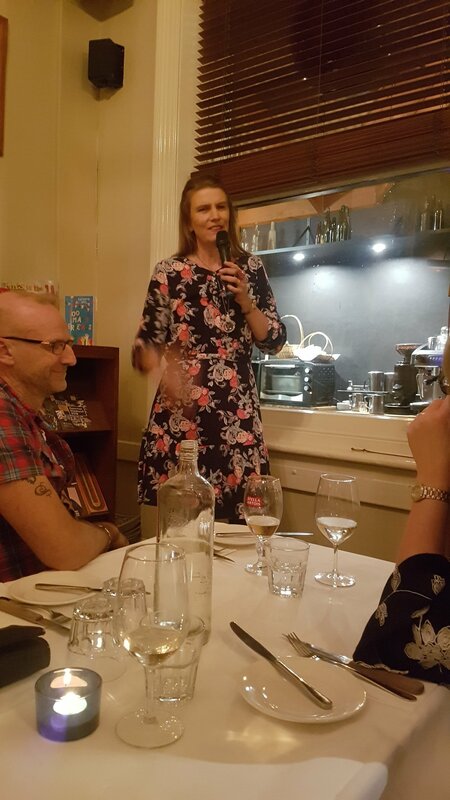 We were also fortunate our dinner date conicided with Kathryn Apel's (aka Kat) Adelaide visit as a May Gibbs Children's Literature Trust fellow. Kat may have felt out of place in our little big city but quickly found her comfort zone while sharing her love of all things poetry. And as she spoke, the entire crowd fell silent and remained in awe of Kat's ability to write in verse and her calm composure throughout a number of microphone malfunctions. Kat talked about her personal experiencces and the inspiration behind Bully on the Bus and how she brought her latest verse novel to life after a conversation with a mother whose daughter had possibly too many friends. She impressed with examples of shape poems and how to lose yourself while composing zentangles. You can find out more about Kat and her writing on her website or here on twitter with her one wonky whisker. Thanks again for joining us Kat.